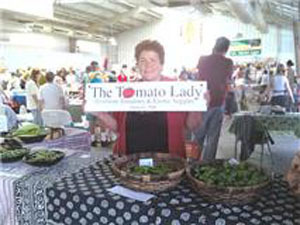 Yesterday I returned to our Farmers Market here in Santa Fe, NM as the ‘Tomato Lady’ and sold out of my tomatoes by 10 am. It’s been a long wait all summer for my tomatoes to ripen and they have started but are not full blown yet. So I had some tomatoes but not a ton. In another couple of weeks, I should be overwhelmed with tomatoes. 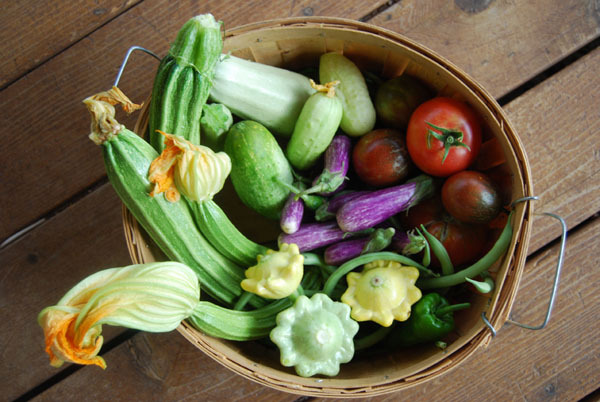 I also had Costata Romanesco and Lungo Bianco zucchini, Bennings Green Tint and Yellow Custard scallop summer squash, Fairytale eggplants, Shishito peppers, Padron peppers, Parade, Armenian cucumbers and Rattlesnake pole beans. 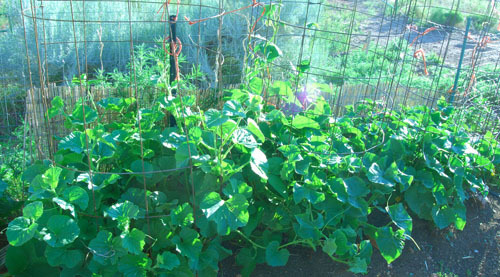 For tomatoes I had Early Wonder, Pantano Romanesco, Goliath, Sun Sugar and Black Cherry and a few Costuluto Genovese. Hope I have lots more next week! Here’s a picture of the first garden harvest that I actually got on July 24! It was small but tasty! ‘Romanesco Costata’ summer squash, ‘Lungo Bianco di Sicily’ summer squash, ‘Yellow Custard’ scalloped summer squash, ‘Bennings Green Tint’ scallop summer squash, ‘Fairy’ eggplants, bush beans, cucumbers, ‘Shishitos’ and ‘Padron’ peppers are really kicking, and a few tomatoes. Now on August 2, almost everything is going bonkers except the tomatoes-I’m still waiting for the tomatoes to really show up soon in a major way! 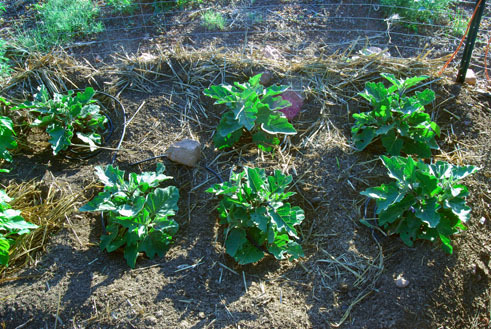 I planted the shishito and padron peppers and the fairy eggplants. I still have to plant the Thai yellow egg eggplants that are just begging to go into the ground. They have been inside under lights since March-April and I have been trying to wait patiently till the nights warm up but I’m afraid I’m not very good at waiting. I guess I got spoiled last year with such a mild Spring. Everything was planted and up by now. Not this year! Today was the right time. When planting the shishito peppers one of mine already has small peppers and it is still May! It is one of the ones I started in March. Peppers love heat. Today is going to be 81 degrees so they should love that! Today I got some more holes ready for the Shishito peppers and a new variety for me called Padron peppers. Most are not hot but an occasional one might have a little heat. 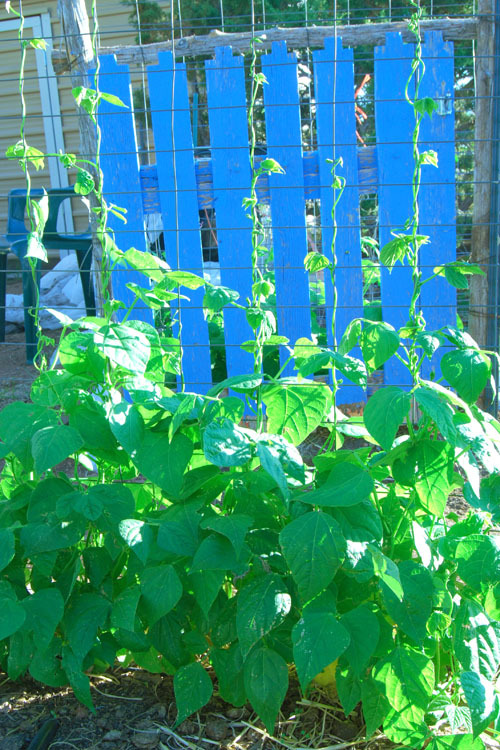 I don’t grow the famous green or red chili pepper famous in New Mexico in my garden as I’d have to plant my whole garden with chili peppers so I buy them from the Hatch chili farmers since I buy them by the bushel! The Shishito pepper is from Japan and is green and about 2-3 inches long and kind of skinny. 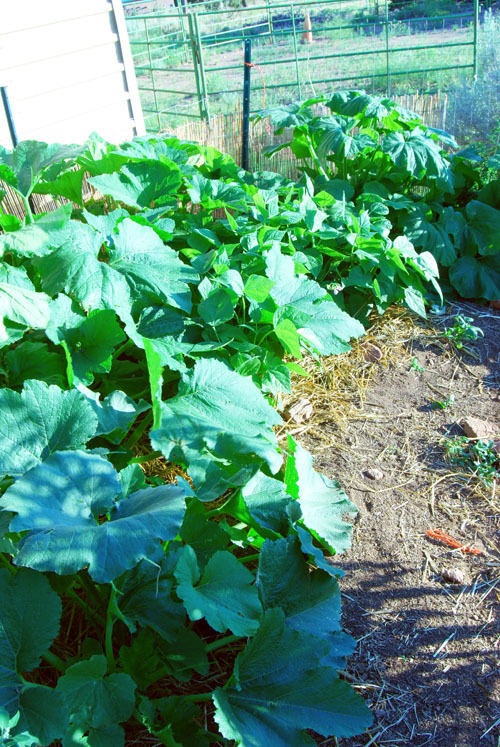 I found it at the Santa Fe Farmer’s Market 2 years ago where it was $10/lb and thought I’d better grow my own at that price. 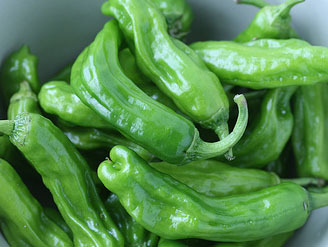 The Padron pepper is from Spain and is also green and a little blockier in shape and used in Tapas. I like to sautee them in a good olive oil and sprinkle rock salt over them and serve them as an horderves.